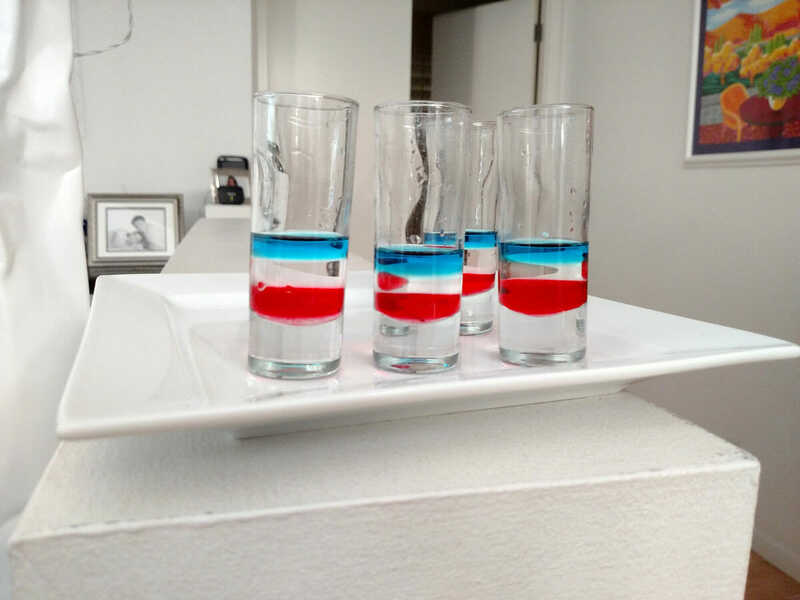 I wanted to make an appropriate cocktail for our July 4 party, so I tried a red, white, and blue layered drink. The key to all layered drinks is to put the densest material on bottom, followed by the next lighter, and so on. The problem with this kind of flag drink is that most clear liquors tend to be the lightest and thus aren't appropriate for the middle band. The bottom of this drink is grenadine syrup. The middle is peach schnapps. The top is blue curacao. Unfortunately, both the blue and the red on the first try were too close to the clear such that after about 5 minutes they started bleeding into the clear area. I solved this by adding some honey to the grenadine to make it heavier, and I diluted the blue curacao with water to make it lighter (even a 50:50 dilution did not seem to have much affect on its color). That did the trick. Typically, one carefully pours each layer over an inverted spoon to keep them from mixing, but I wanted to use these tall thin glasses and a spoon would not fit. After trying several things, I used one of those large 4-6 ounce eyedroppers that are for feeding babies and pets. That worked great. How do they taste? Uh, don't they look great! Actually, they tasted better than I had imagined for a drink concocted of ingredients chosen solely for their color and density. Tasted sort of like grape juice.